Haiti Action Committee adds its voice to denounce the decision by the Trump Administration to end Temporary Protected Status (TPS) for an estimated 59,000 Haitians. We stand in solidarity with TPS and DACA recipients as well as all refugees and immigrants under attack. It is time for the passage of legislation such as HR 4253 and S 2144 or other alternative that is inclusive and beneficial for the broader immigrant community, which allows DACA and TPS recipients to stay, and gives them a path to permanent legal status. The Immigration Act of 1990 created TPS to benefit people unable to return safely to their home country because of ongoing armed conflict, environmental disaster or other extraordinary and temporary conditions. Haiti received TPS after the earthquake of 2010. Thirteen countries had TPS status when Trump came to power. His administration ended the programs for Guinea, Liberia, and Sierra Leone in April, Nicaragua and Haiti in November 2017. Decisions on Hondurans and Salvadorans will come soon. 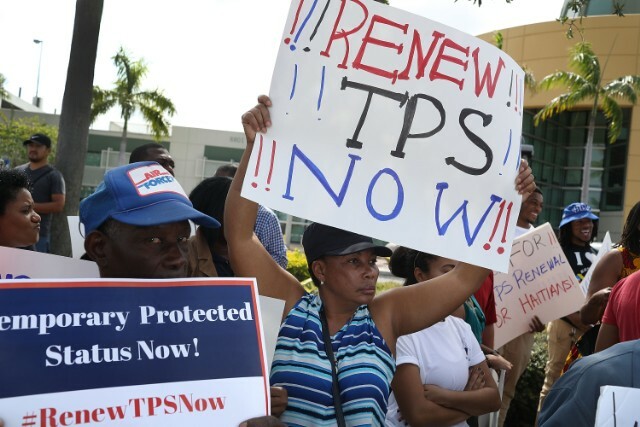 Haitian recipients of TPS have until July 22, 2019 to leave the US. Including TPS Haitians, their US-born children and spouses. Haiti could face the return of up to 200,000 people. It is outrageous that the Trump administration has ended TPS for Haitians, given the dire country conditions that make TPS renewal such an absolute necessity. Members of Haiti Action Committee, an organization that works in solidarity with grassroots organizations, frequently visit Haiti. We are appalled at the unchanging miserable conditions – the lack of basic services including clean drinking water, sanitation, and health care. The very, very slow process of recovery from hurricanes and the earthquake has negatively impacted the health and well being of the population. The basic needs of the majority population are not being met. Returning 200,000 people to Haiti unconscionably exposes them to these conditions and will greatly exacerbate the present crisis. Compounding the above challenges is the on-going political crisis in the country since the bloody 2004 coup d’état against the democratic government of President Aristide. Almost daily, demonstrations break out in cities and towns against the government of Jovenel Moise, increasingly seen as being totally corrupt by a large segment of the population inside Haiti and in the diaspora. Peaceful protests of the government’s abusive extortion practices of women and other small retailers, motorists and transportation workers are met with brutal repression by the police that too frequently result in death or serious injuries. The estimated 59,000 TPS recipients provide a major source of support for their families and network of relatives. The remittances keep their dependents in Haiti alive and local economies afloat. Repatriation will result in family break up and deprive former TPS recipients, now returnees, and their dependents of the means to live. The conservative statistics below are alarming even as other reports claim higher numbers. Though hurricanes Irma and Maria did not hit Haiti directly, the heavy rains and strong winds caused great damage to houses and the local agriculture in northern Haiti. These and hurricane Matthew that struck the south in 2016 compounded the massive devastation of the earthquake from which Haiti has yet to recover. The situation in Haiti is dire according to a report by the Global Justice Clinic of NYU School of Law. Hurricane Matthew displaced 180,000 people, destroyed 104,000 houses and damaged an additional 133,000, affecting the well being of more than two million people. Housing loss and damage totaled USD 856 million. The hurricane destroyed or damaged 133 hospitals, clinics, and health posts and affected 1670 schools. People have not received sufficient aid to rebuild their homes, farms and businesses. A severe hunger crisis is spreading in that area and people are migrating to Port-au-Prince to live with family in order to survive. The income from TPS recipients and other Haitian immigrants plays a vital role in Haiti’s recovery by providing economic support for friends and relatives back home. The resources they send regularly are reliable, received directly and are put to good use by community residents striving to rebuild their lives. Similar situations exist for other countries that are also striving to recover from wars, natural and human-made disasters, and who do not have the capacity to repatriate tens of thousands of people. We call for the passage of inclusive legislation that benefits the broader immigrant community, which allows DACA and TPS recipients to stay, and gives them a path to permanent residency and citizenship.